I’ll finally get my in-depth election analysis up next week, but for now, here are a few things to consider. 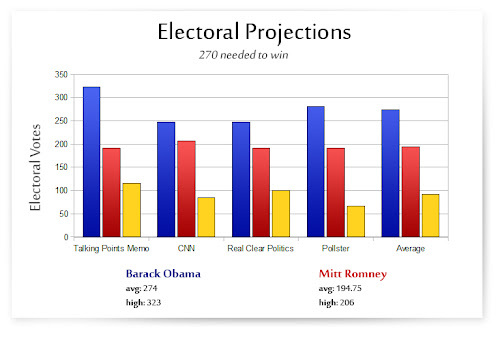 Off the top of my head, I only know of four sites that are running electoral college projections. Talking Points Memo, Pollster, CNN, and Real Clear Politics. Each site has its own methodology for assigning states to candidates based on the “safe”, “lean”, and “tossup” categories, and all can be argued with. For example, only TPM has Florida and its 29 electoral votes assigned to a candidate, even though Barack Obama is leading in Florida and has had more leads in polls than Mitt Romney has, in addition to winning Florida in 2008. None of these sites shows Romney leading in the electoral math, and that is what decides the election. These numbers can change before the election, but they haven’t really changed in the past few months and absent the “big thing” that may or may not happen, I seriously doubt they will move outside the margins. At this point, you can really start thinking about the odds of a comeback, because at this point, I’m sorry, but Mitt Romney is officially losing this race. It’s not close. 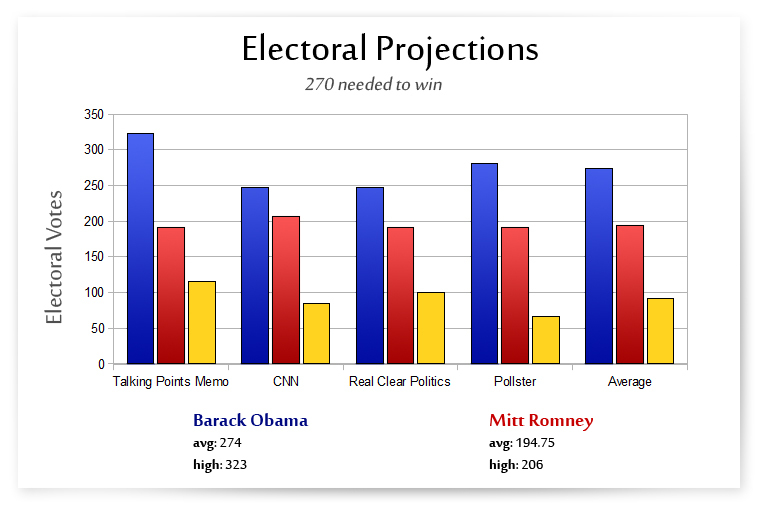 Obama has already won the election by TPM’s and Pollster’s projections, even if you give all remaining tossup EVs to Romney. Obama can afford to lose several states in those projections between now and November, and still won comfortably. Obama only needs 23 electoral votes to win the election, in the CNN and Real Clear Politics projections, or about 27% and 23% respectively. Romney needs 64 (75%) and 79 (79%). The national popular vote doesn’t look much better. Obama is leading Romney by an average of 4.4 points since July 11th, with Obama leading in in 7 polls and Romney leading in just 2, with one of those leads coming from troubled and unreliable Rasmussen. Romney’s largest lead since July 11th was 4 points, from Rasmussen, while Obama’s is 10, from Pew. The actual averages — not the spread — is Obama 6.4 points to Romney’s 2.5 points. Going back to May 9th, Obama has lead in 29 polls to Romney’s 5. Three of Fox News’s latest polls give Obama a lead, including three straight. Then there are the relentless hits the Romney campaign has been taking. The tax issue looks like it’s going to follow Mitt Romney all throughout the election and it may be a killing blow if Obama brings it up during a debate. Although it looked like Harry Reid may have given Romney a break when he said that a trusted source told him that Romney hasn’t paid any taxes at all for the past ten years, beyond what he’s already released — an anonymous smear — it looks like that may now not be the case. Several journalists have zeroed in on John Huntsman Sr. as Reid’s source. Huntsman is a Republican, after Reid said his source was a Republican, and worked as a finance officer at Bain Capital while Mitt Romney was the CEO, putting him in the best position of anyone to know what Romney was doing with his taxes. Huntsman and Reid are from neighboring states and Huntsman donated to Harry Reid’s reelection campaign at least once in the past. If the press puts significant pressure on Huntsman, we could get confirmation within weeks for an unimpeachable source that Romney has been hiding his tax returns because he hasn’t been paying any taxes. That would, I assume, be the end of his campaign. But that’s still (rapidly solidifying) speculation. Then there’s the foreign policy disaster tour. A lot of conservatives pretended not only that Romney didn’t have a bad tour, but that he actually had a good one. What they don’t understand is that in today’s politics, that doesn’t matter. The perception is that it was a disaster, and the media (legitimately) reported it as such. That damaged Romney’s image. As a domestic governor and never a legislature, Romney has no foreign policy experience at all. Even Obama had some such experience from sitting on important international committees in the U.S. Senate, and of course as President, has built a strong foreign policy record with very few avoidable incidents. Romney’s tendency to change positions within minutes and hours of taking a stand aren’t helping, either. A poll earlier this year found that a lot of Republican voters think Romney will say anything to become President. I don’t have a link to that, despite remembering seeing it, so take it with a grain of salt. But it’s not really a stretch. Romney said he was more pro-gay rights and more pro-choice than Ted Kennedy, when Romney ran against Kennedy for the Senate some time ago, and he maintained that platform while running for Governor of Massachusetts. As Governor, Romney crafted and implemented a universal health care system nearly identical to ObamaCare, right down to the individual mandate. Now running as President, Romney refuses to defend his own health care system while attacking its identical twin, began professing to be anti-gay and anti-choice during the GOP primaries, and has flipped on a host of other issues, sometimes within the same day, after that. The election is still three months away, but the national conventions are only two weeks out. Romney is about to select his running mate while still dragging the tax baggage around, trailing in the polls, and trailing badly in electoral projections. I’ve yet to see any electoral projection showing Mitt Romney with a lead, much less already winning. That’s because there are no state polls showing such a thing. Mitt Romney is losing the election; Mitt Romney is in trouble. That graph shows every poll on Real Clear Politics from mid-December of 2011 through this week. It may be hard to comprehend how stable this race looks from a thousand feet up, until you see a picture of it. There’s your picture.